Credit card rates offered to consumers for new accounts continued to inch up and hit new highs, while rates for small-business owners and students remained steady since earlier this month. The average consumer credit card rate for the overall market--customers with varied credit--was 16.80%, according to IndexCreditCards.com's latest survey. That's slightly above the mid-March average of 16.67% and almost a full percentage point above the survey just six months ago when the average overall consumer rate was at 15.94%. Credit card rates went up last year as issuers scrambled to prepare for new regulations from the Credit CARD Act, the bulk of which went into effect Feb. 22. Among the provisions, those rules prohibit credit card issuers from raising rates on existing balances, unless cardholders are more than 60 days late on payments, and they ban credit card companies from hiking rates on new purchases during an account's first year. After that, they must give customers 45 days notice for rate increases and the chance to opt out. Rates went up on consumer credit cards since March 15, regardless of whether the cards offered rewards. Average rates for non-reward cards inched up to 15.53% from 15.32%, and reward card rates rose to 17.35% from 17.24%. Even consumers with excellent credit weren't spared. 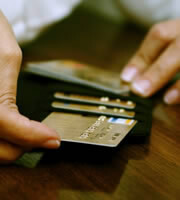 The overall credit card rate for these customers was 12.79%, compared to mid-month's 12.61%. On average, consumers with excellent credit were offered 11.09% for non-rewards cards and 13.52% for rewards cards. "Average student credit card rates remained the same, as did business credit card rates. It's still unclear how the student credit card market will shake out in the coming months, now that credit card companies are restricted in their methods of marketing to college students on campuses and can't issue cards to students under 21 unless the young people get adults to co-sign or can prove they have sufficient incomes to make payments. Much attention has focused on business credit cards, because they are not subject to the Credit CARD Act's consumer protections. Experts have speculated that rates for small-business owners would go up, although perhaps not in the near term. Rates continued to be higher for business rewards cards versus non-rewards cards, which still offer some rates under 10%. To pinpoint a single "average" rate, IndexCreditCards.com attempts to include all of the various rate tiers that card issuers offer based on an applicant's credit history, as well as the different rates associated with non-reward versus reward cards. Consumers with better credit histories typically can find offers below the average, while those with bad credit histories will likely be offered rates higher than the average. It's not unusual for credit cards rates to differ by 10 percentage points for the same card, depending on the customer's credit history.